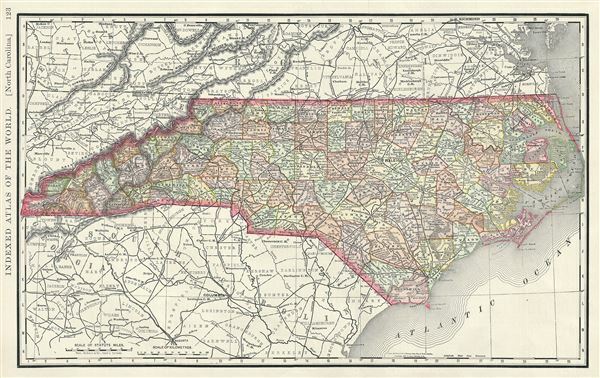 A beautiful 1888 map of North Carolina, United States, issued by Rand McNally and Company. The map covers the entire state of North Carolina, including parts of the neighboring states of Virginia, Kentucky, Georgia, Tennessee and South Carolina. This extremely detailed map identifies several towns, rivers, cities, mountains, marshes, capes, railroads and other important topographical details. Cape Fear, Cape Lookout and Cape Hatteras are identified. The Great Smokey Mountains are also noted. Map is color coded according to counties and relief is shown by hachure. This map was issued as plate no. 123 in the 1893 edition of Rand McNally and Company's Indexed Atlas of the World- possibly the finest atlas Rand McNally ever issued. Rumsey 2094.026 (1889 edition). Philips (atlases) 952.